Mold in the home: Health hazard or hype? Mold is more likely to grow in areas with water or dampness, such as bathrooms and basements. CNN's Dr. Sanjay Gupta finds mold may be a hazard for some people with allergies, but for most it's just a nuisance. 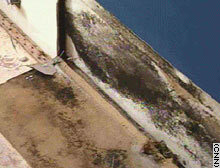 (CNN) -- Mold lives in every house and every yard, but is it really a growing menace that torments healthy homeowners? Experts say that, for most people, the microscopic fungi are no cause for alarm. "You can go in any home -- any wall, any cabinet -- and swab that area. You're going to have mold because it's part of the environment," says David Bledsoe of Healthy Air, a company that specializes in eradicating indoor air pollution. Mold spores continually float in and out of houses and other environments, and most lie dormant for years, Bledsoe said. But given the proper condition of excessive moisture, some spores germinate, which spurs mold growth on anything from wood and carpet to foods, making some people feel sick. The lesson was something homeowner Gloria Grene learned the hard way. A broken pipe flooded her basement, and her plumbing problem quickly turned into a mold problem. Grene says the mold has affected her health. "The moment I step into the house," she says, "I carry ... a tissue with me and my eyes start watering." She says that, out of the house, she has more energy and less redness in the face but the symptoms return as soon as she returns home. Dr. Stanley Fineman, an allergist in Atlanta, hears a lot about mold from his patients. "About 35 percent of the population has allergies," Fineman explained. "In other words, [they have] a predisposition to develop an allergic sensitivity to a variety of things, including molds. And in those patients, we frequently see molds as a problem or trigger factor." For those sensitive to molds, prolonged exposure can cause eye irritation, nasal stuffiness or wheezing, according to the Centers for Disease Control and Prevention. More severe reactions are possible in people with allergies, asthma, respiratory disease or a weakened immune system and include fever, shortness of breath or infection. But Fineman worries that recent lawsuits over moldy homes and reports of "toxic mold" have fueled undue hysteria. "We see a lot of patients who read articles or talk to other people and are really scared of the fact they might get sick from mold exposure," Fineman says. While people need to know if they have a mold problem, they shouldn't obsess over it, Fineman advised. "[For] the average person who goes into a room that has a high mold count ... it would be an irritant," Fineman says. "But it would be the same type of effect if they went into a room that had smoke." The Environmental Protection Agency also plays down the hype surrounding the health threat of mold. "I think the notion that this is some widespread epidemic in the United States is really overblown," says the EPA's Elissa Feldman. So what should you do if you've got a moldy menace? Go to the source, Feldman says. "If you have a mold problem, you have a moisture problem," Feldman explains. "If you have a moisture problem, you need to find out what it is and fix it." According to the EPA, if you have more than 10 square feet of visible mold, it's time to call in a professional. But in modest cases, the answer can be as simple as a call to the plumber to fix leaky pipes, and a little soapy water. The CDC reports a thorough cleaning with bleach and water removes most cases of growing mold. Real estate investor Louie Prestigiacomo isn't alarmed by potential mold health effects. He's cleaning up a home overwhelmed by mold and plans to move in. "I know that mold exists everywhere. It exists in nature and everybody's home," Prestigiacomo says. "It's just at a higher level here so we're going to eliminate it, then control the moisture, and I'll be fine with it."